Dandin and Mariel, two warriors from Redwall, have wandered four seasons before they find themselves in the land of Southsward. This country was once peaceful, but has been conquered by the Urgan Nagru, his mate Silvamord, and their foul rat hoard, keeping the royal family prisoner and the land oppressed. When Joseph the Bellmaker receives a dream from Martin the Warrior, the founder of Redwall Abbey, he sets off with four friends to help Mariel. They must find a way to cross the wide seas to help save their friends and Southsward. When the queen, her infant son, and their badger nurse Muta escape, Mariel and Dandin team up with Meldrum, a hare, to distract the rats and give Serena time to get away. The plan could cost them their freedom, or even their lives, but success will surely help to save the countryside. 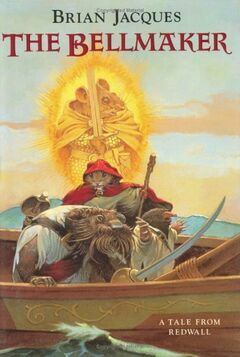 This book is one of the twenty-two books in the Redwall series. Set in a world that doesn’t exist, but is as real as the world that does, they are all filled with grand deeds and life-like heroes. I’ve enjoyed these books for their details, stories, and descriptions of food. Every one of the books is set up with the same three-part story arrangement, characters on quests, accents, and rather stereotyped animal species. It gives the series a sense of unity- characters from one book will mention someone from another, or characters will be re-used in a new story. The books aren’t written in chronological order, so it won’t matter what one you might chose to start on. I recommend these books to anyone who likes adventure, small furry animals, or battles, riddles, feasts, drama, detail, ect.